In 1856 the first known corrugated material was patented for sweatband lining in top hats. During the following four decades other forms of corrugated material were used as packaging material for glass and other products shipped in wooden crates. Then in 1894 the first corrugated box was made. At this point production of corrugated was very slow and the market was skeptical of its use as a dependable shipping material. Over the next several years it was only used to package lightweight items delivered locally. However, by 1900 there was a nationwide network of railroads that made it possible to distribute products throughout the nation. At this point corrugated containers were still not a recognized classification by which to ship goods. The term "contained" meant enclosed on all sides in wood. Then in 1903 corrugated was approved as a valid shipping material for a manufacturer of cereal that had obtained an exception to the official classification. This initial acceptance jump-started the market for corrugated production and by 1910 there were an estimated 50 companies in business making corrugated or solid fiber boxes. 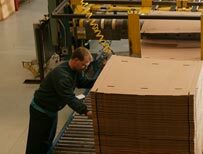 While corrugated lacked the stacking strength of wood it was more affordable, more readily available, lighter weight, more uniform in quality, and more adaptable to volume packing, sealing, and handling. It also offered cushioning and printability advantages. All of these characteristics were attractive to businessmen at that time who were eager to take advantage of nationwide distribution. Corrugated soon became the dominant shipping container and has adapted to and evolved with change over the years to solidify and expand its role.